One of the goals I contemplate for myself on a near weekly basis is rising earlier every day. As a person who works from home and knows what damage slumps can do to motivation and productivity, I’ve wanted to create a better way to do things. The few times I’ve found myself up before the sun turned out to be very good days where I truly felt accomplished. As a writer with a family, a lot of my evenings are filled with constant interruptions that leave me frustrated and unproductive. At one time I was a night person who preferred to sleep all day, but the older I get, the earlier I find myself dropping into bed exhausted. Getting up earlier in the day has distinct benefits and can change the direction of your entire day. Consider how many days you wake up in a rush, trying to get everyone out the door and getting yourself to work on time, which leaves you irritated and exhausted before lunch. By getting up earlier, you give yourself the pleasure of a more relaxed start. You can grab some time alone to fully wake up and get a grip on your day before rushing into life with everyone else. In line with having more time for you, early risers also tend to be more productive. Even with just 30 extra minutes a day, a lot can be done. The dishwasher can be loaded, laundry folded, dinner ingredients prepared. My grandmother used to say certain people in the family would be late to their own funerals because they were habitually late for everything else. By rising earlier, you can be more accomplished before leaving home and arrive at your destination without the rush. You may see better opportunities at work and become known as a reliable, dependable person rather than a harried, stressed-out mess. Waking up earlier allows you to finally have the time to eat a healthy breakfast and fuel your body for the day. Giving your body time to wake up and digest your food properly is necessary for good health. The chugging-coffee-shoving-a-bagel-down-your-throat breakfast you’re used to can become a thing of the past. You can make it happen. Here's what to do. If you want to wake an hour earlier than you usually do moving forward, don’t try to do it all at once. Start with just five minutes and build up from there. When you go to bed each night, think about what you can accomplish in that first 5-10 minutes. It will get easier to reach your hour-earlier goal within a few weeks, and eventually it will become a habit. You may find it hard to wake up earlier because you find it so hard to go to bed at night. You’ll need to start cutting out the distractions in the hour leading up to bedtime, including television and caffeine. Try reading a book before bed rather than watching cable or sitting with a to-do list for the next day. By implementing a bedtime routine in your life to ensure you get enough sleep, you will find it easier to rise earlier. Most people put their alarms conveniently right next to their beds at night, making it too easy to slam the snooze button every five minutes. Try moving your clock to a table on the other side of the room. Or get a more annoying alarm clock that doesn’t have a snooze option. Even with extra time in the morning, it can make you crazy to face a thousand things to do each time you wake up. Start preparing the night before for an easier morning. Have your clothing selected, your lunch packed, and your car keys in a safe location. This way you can get up with your coffee and quiet time to look forward to each day. While the extra time in the day can be rewarding enough, don’t forget to pat yourself on the back for achieving your goal. Pick a morning or two a week that is all for you. Rather than getting household chores done, use your early morning time to dive into that book you’ve wanted to read, take a long soak in the tub, or watch your favorite show on the DVR without interruption. It will give you something to look forward to each week and remind you of your success. Much of adopting a new way of life is mind over matter. Continue to realize the positives your changes are bringing about and find the motivation to keep moving forward with positive changes in your life. 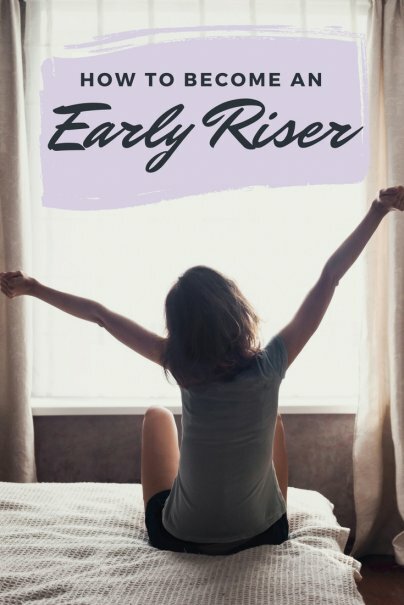 Did you switch from being a night owl to an early riser? How did you do it? Good list, most of what you talk about worked for me. I moved to in bed at 8, lights out by 9, 10 at the latest, up at 5. Still getting 8 hours of sleep a night that way. Gonna try this. Really hope it works! I'm not really a morning person per se, but I prefer being up early and working to staying up late and trying to get stuff done. The thing I like the most about being up early is that no one else is, so I feel like I can really get more done. Traffic is lighter, the phone isn't ringing, and everyone else in the house is asleep. It's golden, even though it takes me a few cups of coffee to feel human at 5AM. Well-written article and great tips! I'm guilty of sleeping in too often. On the weekends, I sleep until 10:30 a.m. Even when I wake up, I lounge in my bed for a while. I don't really see sleeping in on weekends as a problem, but I have noticed recently that even getting up just 15 minutes earlier during the work week allows me to do a tremendous amount! I like your idea of getting up earlier in small increments. I think this will work best for me, knowing that I'm lazy in the morning. Very good article with sufficient tips. I definitely need to start becoming more productive and efficient in the morning and your tips will really help. There are too many days in which I find myself rushing in the morning and getting my day off to a stressful start. I will work to ensure that the aforementioned routine will become a thing of the past. From all my years of experience, if you want to be a morning person make sure that you go to bed early and cut out caffeine after noon. Also, get a cat. They're like little biological alarm clocks. I love waking up early. It just feels like I can get so much more done in the day. I get tired and sleepy way too early in the evening anyway. Cats are a great way to get you up, but they can be lethal in keeping you in bed longer if they decide to snuggle in the morning. Dialing in an evening routine is what helped me get to the point where I was waking up before the alarm. I always have trouble falling asleep at night, but if I get in bed, turn out the main light with just my nightstand light on for working on ideas for projects and reading until I get tired, I fall asleep a lot faster. Also, my smartphone screen is pretty bright, so if I plug it in across the room (it's my alarm clock as well) and abandon it for the night before I settle in to read, that helps too. I had a roommate while in the Army that would set his alarm clock back an hour just so he could hit the snooze a few times. Drove me nuts! Now that I am retired from the Army and selling Medicare supplemental insurance I don't have to get up as early. I actually find myself missing those early mornings. Think I will take your advice and shift to an earlier morning. Pushing that alarm clock out of arms reach. Wanna be up at 6 every morning? have a baby. No thank you!! I choose to stick to an alarm.